Foxtails, Inc. is a pseudo-random pile of geekery, silliness and a little bit of “real life” thrown in. We follow entrepreneurial noobie, Timothy J. Fox, III, or “Kit” to his friends, as he and his alter ego Kat, try to navigate the craziness of life. Then we shake it all up and dump it out onto the page, or the screen, or however you’re reading this. We promise, someone will clean up the mess. The comic is currently being produced with initial sketches done traditionally (pencil scribbles, yo!) or on my iPad. Inks are either done by hand using Sakura Micron pens or digitally on my trusty Wacom Cintiq 12wx graphics tablet using Smith Micro’s Manga Studio 5. Coloring and lettering is all done in Adobe Photoshop CS6. Tim Georgi is a graphic designer, artist, colorist and writer. In the comics world, Tim was the designer and webmaster for Elfquest.com, the website for comics publisher Warp Graphics, Inc. His other major claim to fame was as colorist for the first three volumes of Elfquest: Dreamtime, released by Warp through German comics publisher Carlsen Verlag. He is also the artist and writer for the (currenlty on hiatus, possibly in a reboot) webcomic Beyond Neverwonder, a mixed-up cross between “Alice in Wonderland” and “Peter Pan” and Foxtails, Inc., a (new, still in a bit of pre-production) webcomic about the ups and downs of business and everyday life. If you’re curious about some of the other stuff that Tim has done, you can check out his colorist site, Comicolorist. In his spare time, he writes comic book review on his site BubbledText. 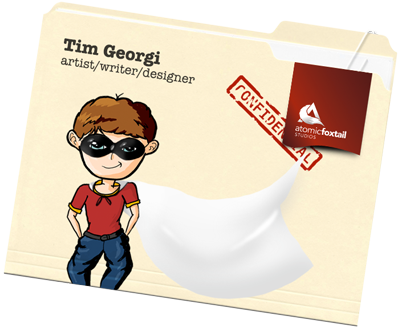 In an alternate dimension, Tim works as a graphic designer and consultant through his company, Skyfall Creative. You can find out more about Tim’s artistic exploits on his website at www.tekitsune.com.